Today, I’m happy to announce a wonderful book giveaway. In my recent post, Family Traditions, I wrote about the importance of traditions and briefly touched on the numerous benefits they provide to families. For one, traditions experienced during childhood can not only help to create wonderful memories, but they also help people become happier and emotionally healthier adults. I feel like I’ve spent the past twenty years writing this book! 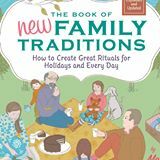 It’s my fourth book on family traditions, and the second edition of my popular “Book of New Family Traditions.” It draws from two decades worth of wisdom I’ve gathered from interviewing hundreds of families, plus what I’ve practiced with my own son, who just started college. It’s a gentle guidebook packed with practical ideas, but I also give a tutorial on how to create rituals and celebrations from scratch that fit your own family like a glove. What’s most gratifying, beyond the great reviews, is how many parents I hear from who say this book guided their family’s journey in deciding what to celebrate, and how. I wish every family with young children who wants to give them a sense of identity and security — and great memories — could get this book! You’ll also find fresh ideas every week posted on my Facebook page, www.facebook.com/TraditionsBook. And I post frequent blog posts about traditions on my website, www.megcox.com. Meg Cox has been kind enough to offer one free and signed copy of her book, The Book of New FamilyTraditions, to one Petit World Citizen reader. Please enter to win via the link to the Rafflecopter giveaway widget at the bottom of this page below. This giveaway is open to US residents only (per the author’s guidelines). The winner will be announced one week from today. When I think of family traditions, I often think of a friend who grew up with a family tradition of having homemade pizza on Friday nights and soups on Sunday. I made this soup last Sunday with her in mind. Sort and rinse lentils. Drain and add them in a large soup pot with barley and 6 cups water. bring to a boil. 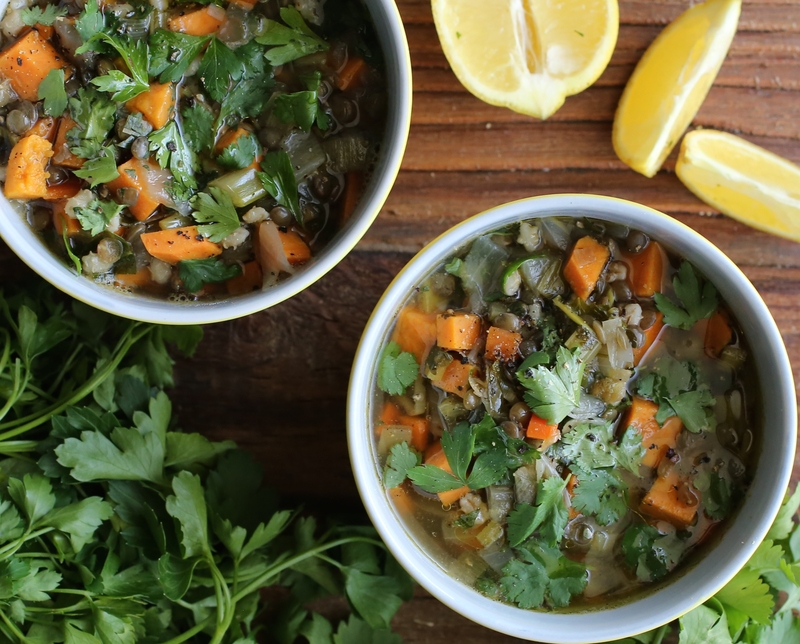 Reduce heat and simmer until lentils are tender but still a little firm, about 20 minutes. Add 2 teaspoons salt. Remove from heat. Meanwhile, in a large pan, heat oil then add onions and a generous pinch of salt and sauté until soft, about 10 minutes. Add leeks and cook until translucent, about 15-20 minutes. Add onion mixture to lentils with sweet potato, carrots and celery. Add enough water to cover vegetables, about 2-3 more cups, bay leaf and cumin. Simmer another 15-25 minutes. 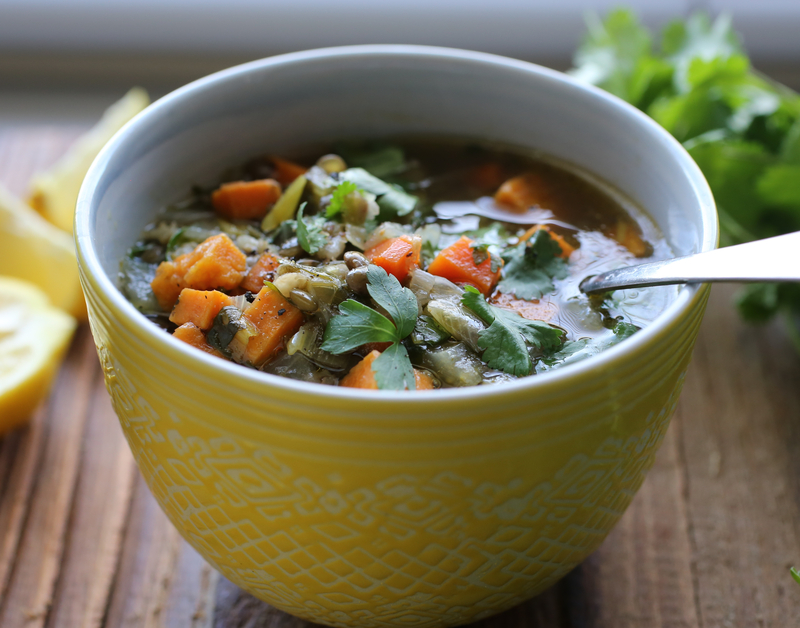 Add cilantro, parsley, cayenne pepper and vegetable broth (the amount depends on your preferred consistency). Taste and adjust salt. Ladle into bowls, serve with a splash of lemon juice and drizzle with olive oil. Garnish with chopped cilantro and parsley, and freshly ground pepper. Please enter to win the book giveaway via the link to below. For more information on the book, including a book trailer, click here. See my New Year Message to readers. Petit World Citizen Book Club coming soon! My favorite tradition is baking and decorating cookies with my children during Christmas. I use my Mom’s recipe and it always brings such lovely memories rushing back. Hi Julie, Sounds like fun, meaningful and great memories you’re creating for your children! Thanks for your comment. Our favorite family tradition was to stay up very late during thanksgiving and christmas and cook different dishes from around the world. Sometimes it would be pot roast and other times, cassava leaves or kibbeh. We don’t do it as regularly as we used to but it’s still a fave! Yum! What a great international cooking tradition for the holidays. I love it! Hi Mandy, what a fun tradition! The pictures over the years must be priceless!